The culturally colourful and historically fascinating Mexico City has plenty to see and do for visitors from all walks of life. The city is well worth exploring en route to the resorts, a great place for a lively weekend away, or even a holiday destination in its own right. Mexico City is also reputed to be the city with the most museums in the world and is sure to appeal to history buffs and art lovers. 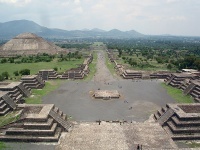 With ancient ruins just a stone's throw from the city, tourists will want to visit the Templo Mayor, the principal temple of the Aztecs and part of Tenochtitlán, as well as the UNESCO World Heritage Site of Teotihuacan, the site of Mexico's largest ancient city, which dates back to around 300 to 600 BC. For a more colonial flavour, visit the beautiful nearby town of Guanajuato, discovered by the Spanish in 1558 for its silver deposits. 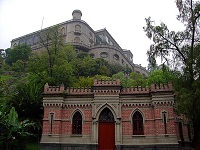 Downtown Mexico City is a great place to soak up the architecture and atmosphere of the stately buildings. 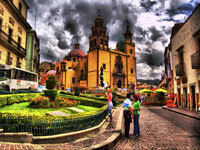 The Zócalo is the main gathering point in the city and is surrounded by historic buildings. 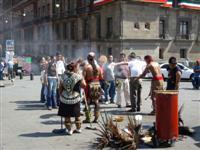 The Plaza Garibaldi-Mariachi is surrounded by cafés and restaurants and is also a favourite spot for tourists. To see the city at its most picturesque, stroll along the cobbled streets of San Angel where ancient mansions and colonial houses make for wonderful photographic opportunities. Art lovers will enjoy the Palacio de Bellas Artes which features the works of Diego Rivera and David Alfaro Siqueiros, as well as 6,000 other works of art, while one of Mexico City's most popular attractions is undoubtedly the Bosque de Chapultepec, Mexico City's largest park, covering an enormous area containing lakes, a zoo, and several museums, including the Museo Nacional de Antropología.